Richard Johann Guttstadt (1879 – 1942) was a retired German Railway senior councillor and married to Hanna Guttstadt, née Semmler. They lived with their daughters Brigitte and Ursula at Sophienstraße 10. Hanna Guttstadt was classified as Aryan and both their daughters as first-level "half-castes". 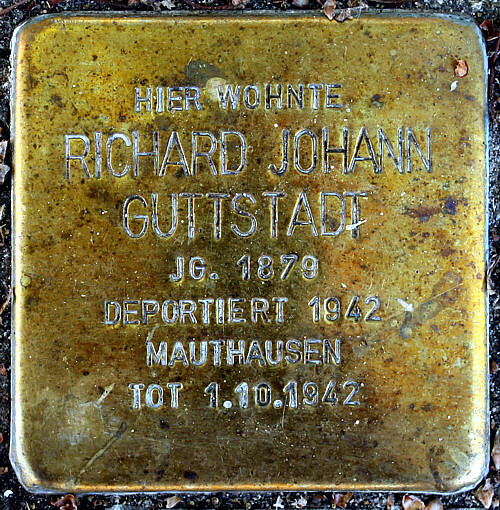 In September 1942, Richard Johann Guttstadt was deported to Mauthausen Concentration Camp, where he died. E - The Jewish Hospital and "Jews' Houses"